Read “Beware the Nine,” a steampunk short story by Laurel Anne Hill, in How Beer Saved the World (Sky Warrior Books, 2013). Here’s a book that takes issue with the popular image of beer as the drink of sports-watching couch potatoes: How Beer Saved the World, an anthology of quirky short stories celebrating beer. Edited by Book View Cafe’s Phyllis Irene Radford, this is a collection of 14 different takes on positive outcomes brought on by beer. Contributing authors include Brenda Clough, Irene Radford, Shannon Page, Mark J Ferrari, Frog and Esther Jones, G. David Nordley, Bob Brown, Nancy Jane Moore, Joyce Reyonds-Ward, Laurel Anne Hill, and others. Beer goes back to the early days of the human race. As it says in the introduction, “Fermented grains have been a mainstay of the human diet almost as long as we have been human.” So pour yourself a cold one and sit down with these stories. 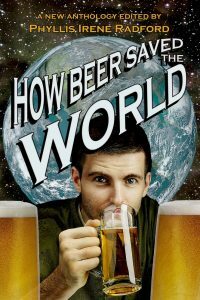 How Beer Saved the World is available in ebook form from Amazon and Smashwords. Purchase the trade paper version at Amazon.com.